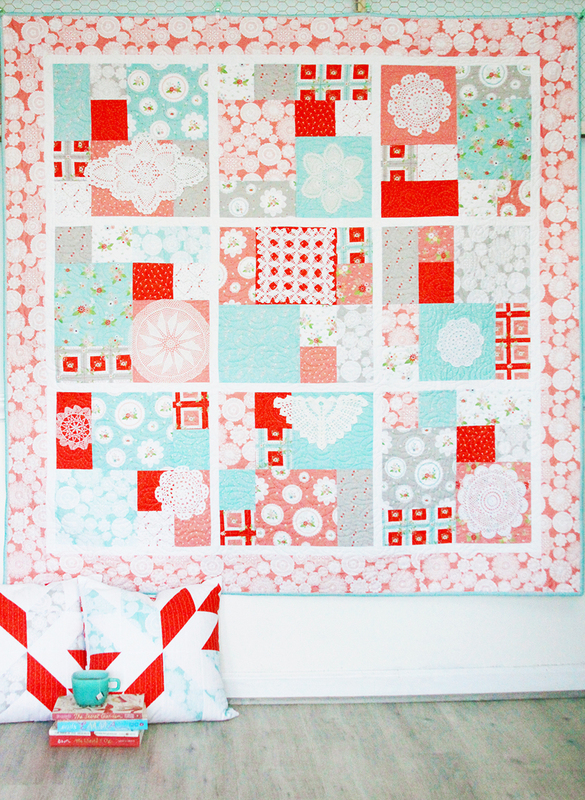 I’m so excited to share this quilt pattern with you! When I designed Vintage Keepsakes, I knew right away I wanted to develop a quilt pattern that would be perfect for showing off vintage doilies. 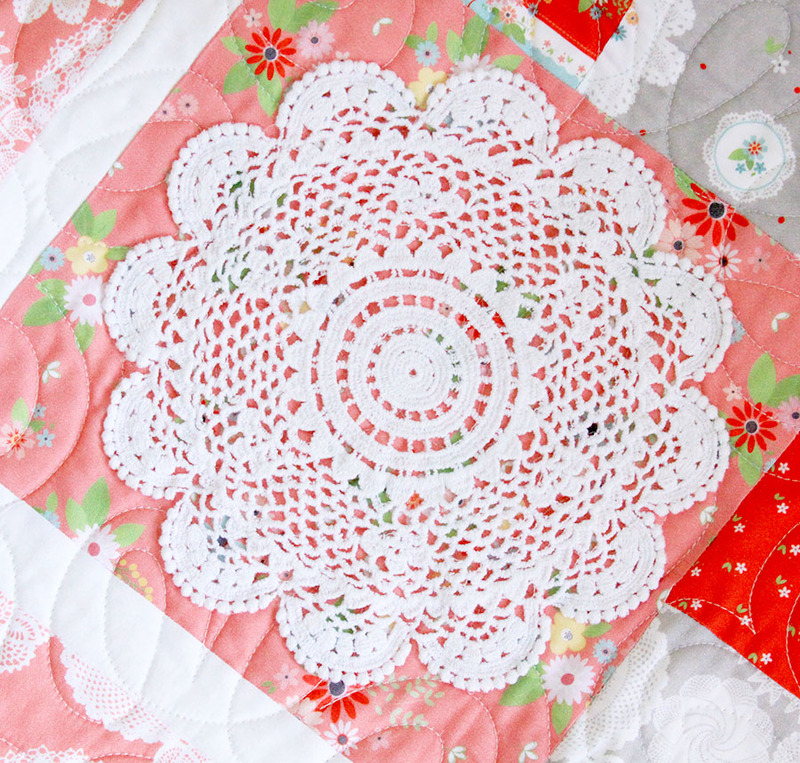 I have such a collection of these and I love that this Vintage Doily Keepsakes quilt highlights some of them! 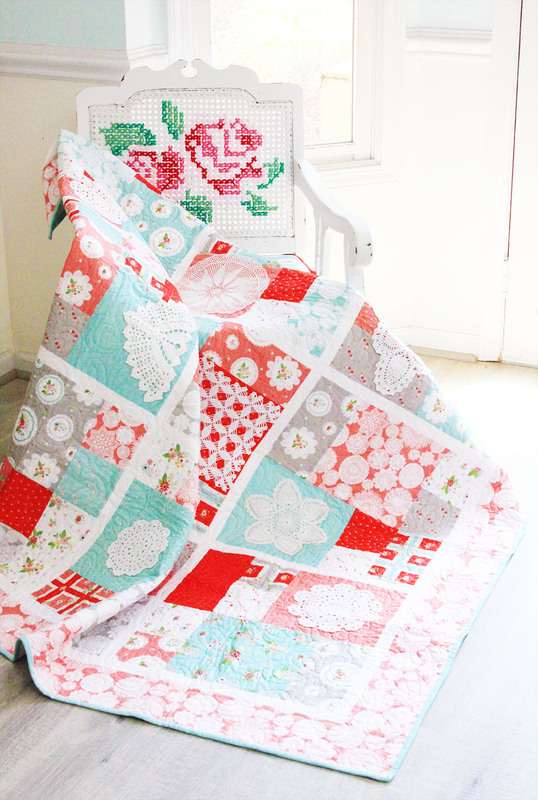 The quilt uses a 10″ stacker (or layer cake) of Vintage Keepsakes and a little fabric for background sashing and a border. It’s so fast to sew together too! It’s a great beginner quilt as well. I think it would be so pretty even without the doilies too. Assorted sizes of doilies. 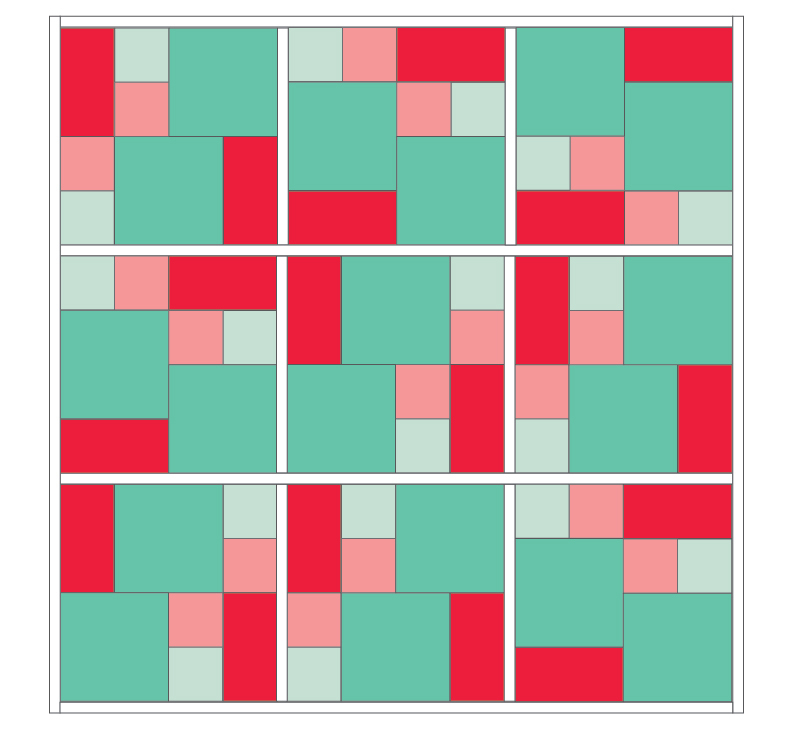 I used 10 but you can cover as many squares as you’d like. If you’d like to purchase an ad-free printable version of this pattern for a low cost – click here! Before cutting, take note if your fabrics are directional. If they are, you’ll want to decide if you want to cut everything out so the all the directional fabrics are the same. Refer to the Layout if you’d like to do this. Trim 16 – 10″ stacker pieces to 10″ x 8 3/4″. Vary the fabrics so you’ll have different fabrics as your large pieces. I used these mostly for the doily background squares so I chose fabrics with smaller, more subtle prints. Cut 18 – 5″ x 10″ pieces and 34 – 5″ x 5″ pieces. 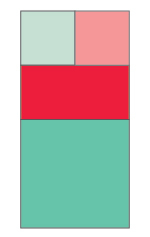 You can cut 9 pieces in half and 9 pieces into fourths, or you can mix and match. Cut some pieces in half, then cut half into half again. It’s up to you! Cut background fabrics into 1 1/2″ strips. Cut border into 5″ strips. Begin with your layout plan. You’ll want a mix of fabrics in each large block. Each block is made of 2 large 10″ squares, 4 – 5″ x 5″ squares and 2 – 5″ x 10″ pieces. Each block is sewn together in two halves. Sew together the two 5″ squares. Trim down the piece to 4 1/4″ x 8 3/4″. Trim a 5″ x 10″ piece down to 4 1/4″ x 8 3/4″. Sew the long side to the two square pieces. 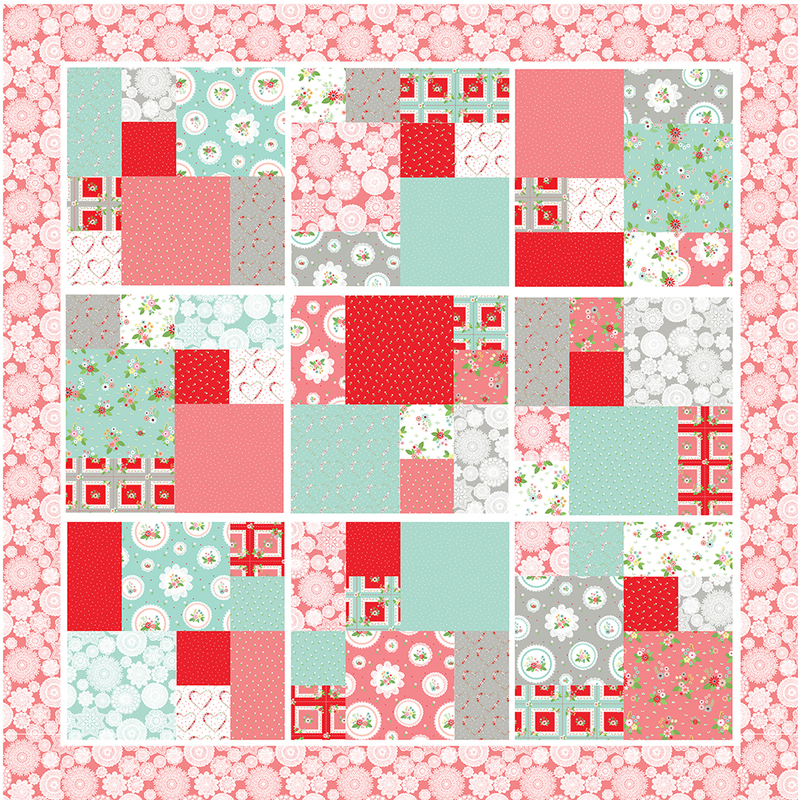 Sew together a similar panel but switch up the order of small pieced squares, rectangle piece and large piece. 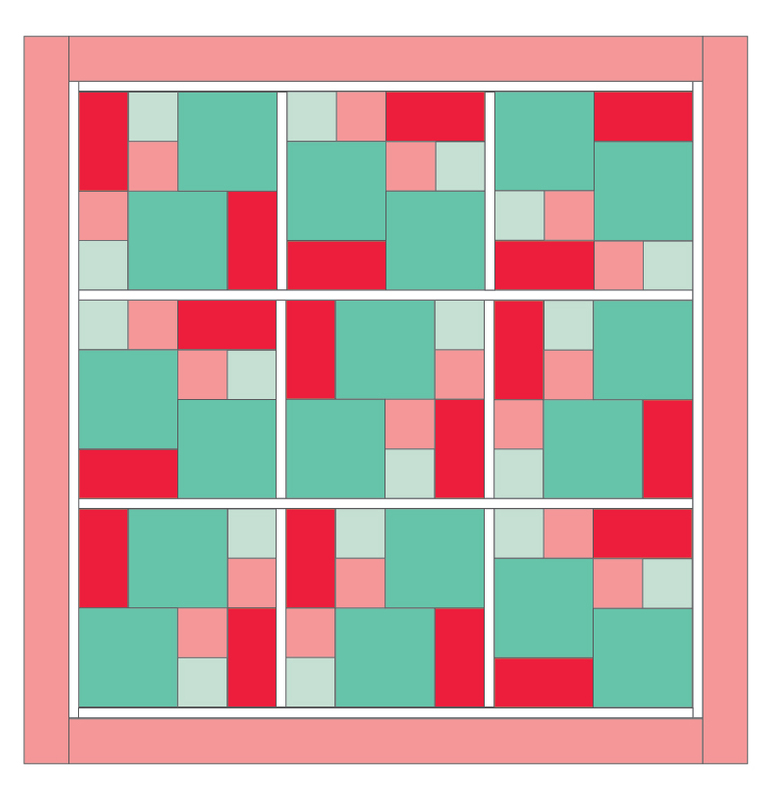 Sew the two panels together to form a 17″ x 17″ square. 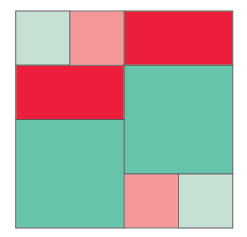 If your squares are slightly different than mine in size that’s totally ok. As long as all your blocks are the same size, that’s the most important thing! 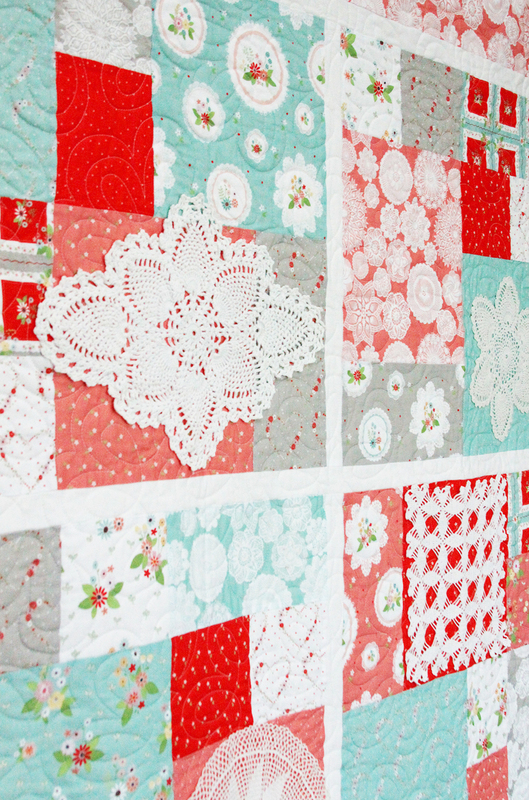 Create 9 patchwork blocks this way. Alternate the direction with some of the center seams going vertical and some horizontal. Cut 6 strips of background fabric 1 1/2″ x the length of your blocks. Sew together three blocks with a background strip between them. Repeat for three rows. Piece together the remaining 1 1/2″ strips. Measure the length of your rows and cut 4 strips this length. Sew together three rows with a strip between each row and above and below the center section of the quilt. Sew the remaining 1 1/2″ strips on the left and right sides of the center quilt top. Piece together the 5″ strips for the outer border. Sew strips to the top and bottom of the quilt top, then the left and right sides. 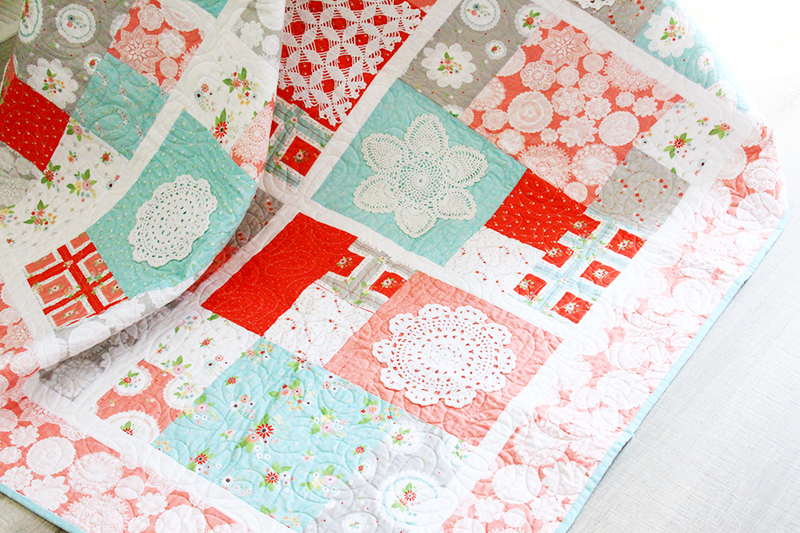 Layer together your quilt top, batting and backing. Quilt and bind your quilt. Now it’s time for the doilies! 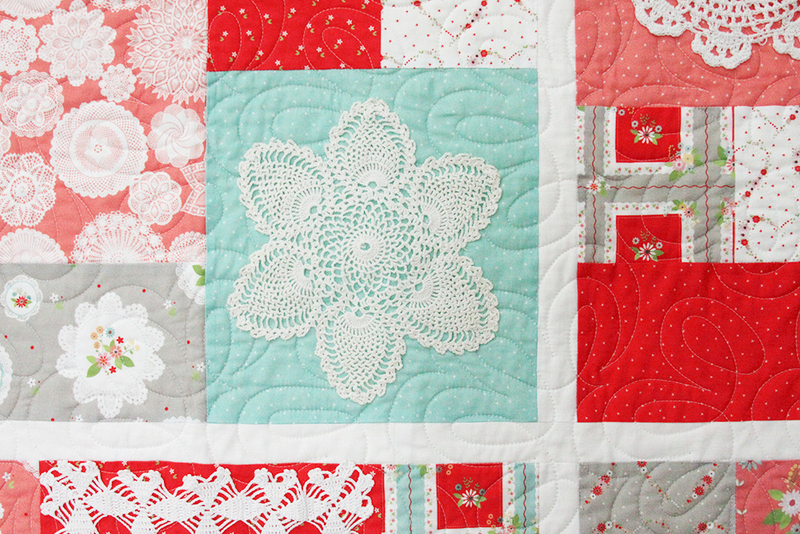 Lay out your quilt and place your doilies on the squares you’d like to cover. You can either hand sew down the doilies or use a strong fabric glue like the one Thermoweb makes. 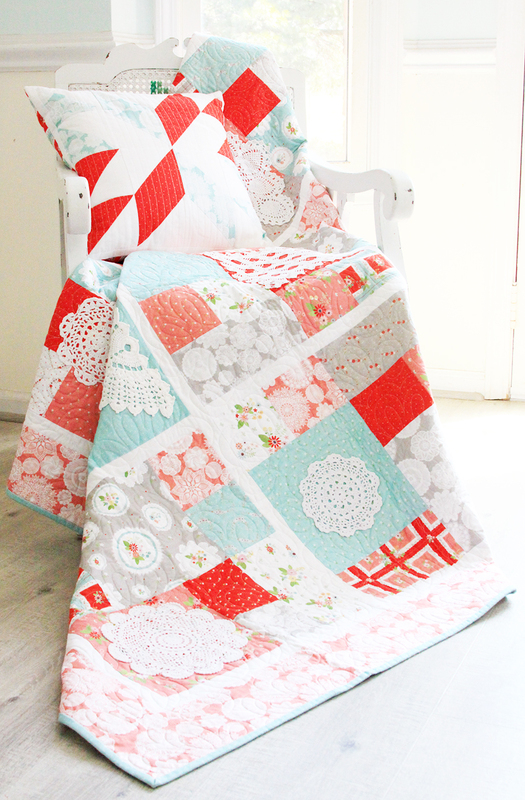 Now you can show off your great new heirloom quilt! This is exactly what I need for my doilies! Can’t wait to try this, thank you! Thanks, Bev! I don’t have a lot of vintage doilies, but I do have a lot of vintage embroidered pieces that would also look grand with your pattern! Can’t wait to give it a whirl! If this is a FREE pattern I don”t see where we can download it Can you please advise? 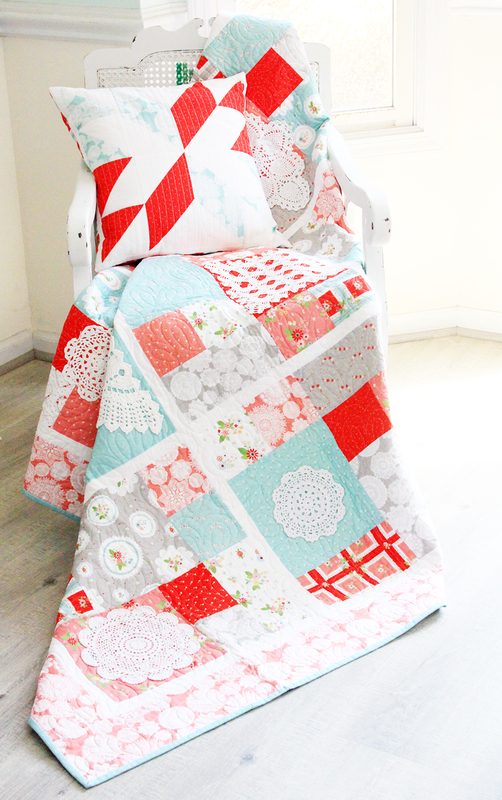 It is a beautiful quilt and fabric!! !Thank you! Hi Patricia! You don’t actually need a paper pattern for this quilt so maybe tutorial would be a better word. But all the instructions to create the quilt are here in the post. If you’d like a printable version (with the exact same instructions, just in an easy-to-print format, you can find one in my shop for a minimal charge. Thanks! Thank you for the free pattern. It will look beautiful made up with different fabrics. This is a beautiful fresh quilt. I collect doiliesand have a bag waiting for a project. I also have a friend having a birthday next month. The perfect print for a gift. 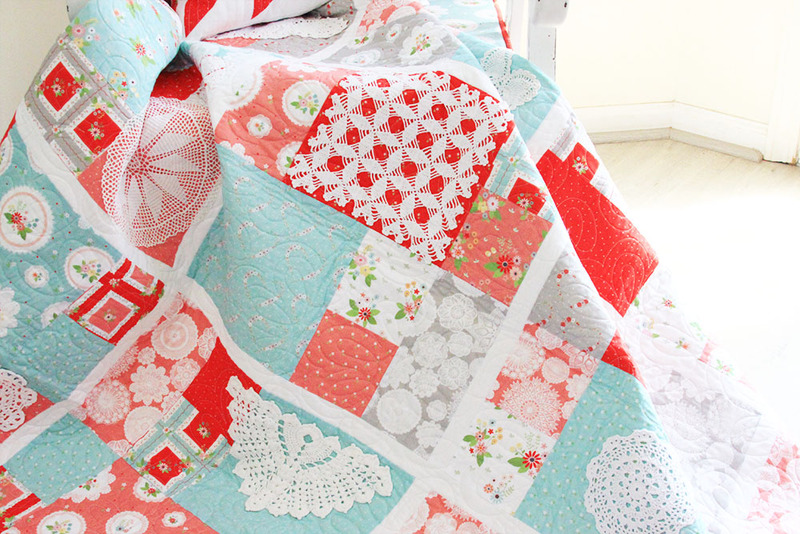 Wow Bev, truly a work of art, and the inexperienced quilter it actually looks fairly simple. Thanks so much for sharing on craft schooling sunday as always! That quilt is just fabulous! I love the addition of the doilies. I have a relative new linkup party on Thursdays called Creative Compulsions geared towards those makers of things. I’d like to invite you to link up!